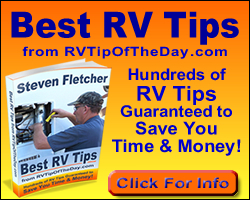 December 16, 2008-- If fire breaks out in a recreational vehicle, the occupants have less than thirty seconds to exit the RV according to fire safety expert Mac McCoy. Nationwide Insurance aims to keep all RVers and their vehicles safe from fires, which is why Nationwide is the first and only company to offer a safety device discount on RV policies. Policyholders who install either an engine fire suppression device or LP gas refrigerator suppression device can receive a five percent discount. These devices not only help prevent property damage and the total loss of a vehicle, they can help save lives. "One way we are showing our support of safety-conscious RV owners is through our fire suppression safety device discount" said Dawn Stoppelmoor, RV product director of Nationwide Insurance. "We understand RV owners value not only their vehicle, but time shared with family and friends while on the road. Our discount is aimed at making sure RVers are able protect what matters most to them." Check extinguishers. Before traveling, be sure your fire extinguisher is functional and contains proper pressurization. You should keep multiple extinguishers on hand throughout the vehicle and understand which extinguisher is effective on different types of fires. Also, be sure to verify that your smoke detectors are in working order. Avoid transmission fires. Many fires are caused by fluid leaking from the transmission, which can be ignited if it comes in contact with the exhaust system. Complete a thorough check of the underside of your RV as part of your pre-trip inspection. Inspect electrical systems. A common cause of fire is a short in the 12-volt electrical system. Check the engine compartment wiring as another part of your pre-trip inspection. Replace any damaged or frayed wires and make sure the connections are secure. Have an evacuation plan. While it may seem simple, a key step to fire safety is ensuring that everyone traveling knows how to operate the latches of doors and windows, allowing for a quick exit in an emergency situation. Stay kitchen savvy. Be sure to keep clothes, linens and other combustibles far from the kitchen area. Stay alert while cooking as items such paper towels and curtains are likely to be close to the stove, creating a fire hazard. These are a few key tips for preventing fires. Contact your local fire department, take an RV safety seminar, or log on to www.macthefireguy.com for additional tips. The safety device discount is currently available in Michigan, Iowa, Ohio, Arizona, Illinois, Montana, Oregon, Texas, Washington, Kansas, Missouri, Wyoming, Idaho, Nevada, New Mexico, Nebraska, Wisconsin, Tennessee, Pennsylvania, South Dakota, Utah, Colorado, Minnesota, Indiana, Florida, Virginia, Delaware, Georgia, Maryland, North Carolina, North Dakota, and South Carolina. Underwritten by Nationwide Mutual Insurance Company and affiliated companies. Subject to underwriting guidelines, review, and approval. Not available to all persons in all states. Click on www.nationwide.com to learn more about RV insurance or to find an agent.